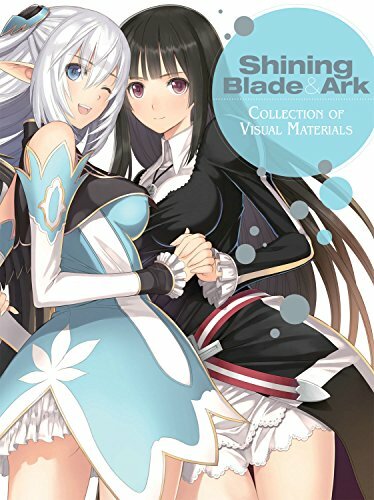 Here's another video game companion book translated by Udon Entertainment, this time for fans of Shining Blade (2012) and Shining Ark (2013). Presentation is not different from other Japanese video game artbooks. So far, I've reviewed the artbooks for Shining Hearts, Shining Force Feather and Shining Force EXA. I will not be surprised if there are more Shining artbooks lined up. The book's a 224-page paperback that features the character designs and profiles followed by environment art, weapons, ships and enemies. Each main character is given a full page treatment with a few different poses and many different expressions. These are full coloured illustrations. When you flip the book to latter pages, there are line sketches for the same characters. The artworks are drawn by pin-up artist and character designer Tony Taka. Fans of the game would probably be delighted by the beautiful illustrations. The first few pages of the book feature full page splash images. The artworks for locations, environment, enemies and ships aren't printed as big as those for the characters. Generally speaking, these are the artworks with more details compared to the characters so it would have been better to have them printed larger, but they are not. The environment art are beautiful and I like them. The last few pages features interviews with Tony Taka, producer Tsuyoshi Sawada, director for SEGA Takeshi Ozawa, assistant producer at SEGA Kei Mikami. They talk about the Shining series and of course this two games in particular. It's a nicely packed artbook with lots of wonderful artworks. Highly recommended to fans.